Hello all... yes, it has been a while. I am in the process of uploading a new layout that I have been playing with for 4 hours. As you can tell by the time, and the way this all looks -- I was NOT successful. I am off to bed, bare with the horrid look, and hopefully I can start the new year off right with an updated blog design and photo of Gavin. Thumbs up for Snuggle Wraps! I'm bummed I don't have enough time to do posts daily. I really want to document everything so Gavin can read this one day. This is just a trying time with his eye poking, and I honestly do not have enough time to do anything. The past few weeks, I have asked family members to take Gavin for a few hours here and there, honestly just so I can clean. I have noticed when he is out of his comfort zone, his eye poking/gouging is much less. Has anyone else encountered this? I'm thinking it's because he is in a different environment and he has other things to concentrate on, rather than the normal busy house we have here, and the sounds he is used to hearing everyday. Whatever it is, I am glad they don't have the challenge of constantly releasing his hands out of his eyes, this way, they can continue to take him and I can get an hour or two of cleaning, and maybe even an hour to blog or even start exercising again (something this past year I have completely neglected and honestly haven't even cared about). I know that's bad to say, but the truth. I need to get back on track with everything in my life. That all being said, I broke down and I purchased the Snugglewraps arm restraints. I was in tears purchasing them, the thought of restraining Gavin made me cry. Honestly, they have really helped. For all you parents out there who deal with an eye poking baby/toddler, I'm sure the car rides have you stressed out. I realized, even a quick trip to the bank can be about 20 minutes in the car. That entire time, Gavin is poking his eyes, and I'm stressed seeing him in the car seat doing this and trying to stop him. It's not safe, and not good to add to the stress. These arm restraints are so HELPFUL for car rides. They are a must, and I think I am going to buy another pair to keep in Troy's truck. At home, they help when he is swinging or jumping. He is still getting vestibular stimulation but he is not pressing. I feel better putting them on when he does these activities, rather than when he is just on the floor playing since they really do restrain movement. I am able to throw them on, put him in his jumper and I can use the bathroom or grab a quick bite to eat. I have been caught in a nasty vicious cycle of stopping everything in my day to just be the eye poking police. This has helped when I need just 10 minutes to do something. If you have any questions, let me know. I highly recommend them! Also, our Thanksgiving Dessert in the dark was a hit! About 20 members of the Bohannan clan experienced this. We all sat around the dining room table, shut off the lights and Troy and I served everybody. We had 3 different pies, and we sliced and served one serving at a time. We took it to the end person, told them what pie it was, and they had to pass in the dark to the appropriate person. It was awesome! I think everybody was able to experience Gavin's world and your different senses come into play. Some mentioned the different feelings of the forks, and the tastes of the pie when you are not looking at it. We even had some whip cream mishaps with my aunt and my sister, so we got some good laughs in too! This will be our new Thanksgiving tradition, and I am so happy and proud to be part of such a wonderful family who has embraced my son's condition to take on this experience with us. Happy Thanksgiving to all my blog friends. I have "met" many wonderful people whose situation is similar to our families thanks to this blog. I have also "met" many kind, people who continue to give their positive comments. Thank you to all of you! We will be starting a new tradition and will be eating our Thanksgiving dessert in the dark. We will be bringing Gavin's world to us on this special day. I have so much to be thankful for, but I am especially thankful for my sight, which I have always taken for granted. I see things in a different way now, thanks to my son. And the world is a lot brighter! You mean a lot to us! Last night, I had the pleasure of speaking to Ethan Haas, the father of Corey Haas. Corey is the little boy mentioned here in the blog that is the youngest in the world to have received gene therapy and vision restored. Ethan found my blog and reached out. I went to sleep last night with a much better understanding of not only the procedure, but of the the key names of doctors, research scientists, etc involved in the gene therapy. He mentioned Corey is now playing Little League, and does not need to use his white cane. Many times during our conversation I was moved to tears. The family has hit the nail on the head, and they want to help others just like Corey has been helped. They have helped me gain a better understanding as well as offer a deeper sense of hope for our future. They are now recruiting candidates possibly as young as 4 years old. This is a HUGE change from just a year ago, when I believe the youngest candidate was a teenager or young adult. We are going to move even more quickly with getting Gavin's blood work done. I see a need to do this sooner rather than later. Just so we know what path we are on with the identified gene. We still do not know what gene Gavin is affected by. Thank you Ethan. Thank you Haas family for sharing your wealth of knowledge and your son's story not just to me, but to the world. I appreciate your pay it forward attitude, that's what this is all about. Helping one another. Funny things said/done the past week or so with my 5 year old, Landon. I wanted to document for me, to remember -- but thought I would share with you as well. 3. I was asked if Santa was real. *insert crying face* I did my explanation and further asked if we can make a trip to the North Pole. He said if we got in the car and started driving where it said "N" we would be there really fast. * The "N" he is referring to is the digital display in the car that tells you which way you are going, North, South, etc.. It's that easy, right? 2. Landon asked his dad if King and Queens and castles were real. Troy answered, and Landon asked asked in surprisement (with wide open eyes) "Do the Jacks and Aces live there too?" 3. I told Landon it would be fun as a family if maybe we got a karaokee machine for Christmas, as our family gift. He replied, "No, that wasn't on my order." "Order? ", I ask in utter surprisement, but knowing where this was going. "Yes", he said. "My order to Santa is already done, and I didn't put the karaokee machine on the list". * Um.. hello!?! ORDER? I wanted to ask him what his method of payment was. I had 2 emails sent to me to repost this on my blog... so here it goes. I think it's pretty boring, but fun, nonetheless. Let's see what is on the top of my head of 10 things you may or may not know about me. This is a little out of my element since this blog is for my boy/family -- but hey I will give it a shot. 1. I don't eat meat, but don't consider myself a vegetarian. Weird? Yeah, I just say, "I don't eat meat"." I haven't for about 16 years. 3. I don't like leaving my kids. I enjoy being around them all the time, and relish in every moment. Yes, I need a break from time to time, but I choose to always be with them. I know these days will only be memories one day. 4. I LOVE going to the movies. I don't care how expensive it is now, I am a happy person at the movie theatre. I think that is what I miss most about having kids and not being able to get up and go and make my 2x week trip to the movies. 5. Inside I truly feel like an old soul. I feel like I should have been born in the 1800's, I get such a nostalgic feeling when I look at pictures, etc... from that era of time. 6. I secretely miss my maiden last name as my last name. 8. Komodo dragons and cockroaches make my heart skip a beat in pure, utter fear. 10. Always wanted an "outie" belly button when I was pregnant. All I got was a deeper "innie", it looked like I had a doughnut under my shirt. I think this is pretty cool. We are Disney freaks, and it's so nice they are making this an option for visually impaired. I'm sure this is a start to many more accomodations. I have said this before, I am always moved when I read Helen Keller's quotes, and really try to understand what point she is trying to convey. This is one that really hits home. My happiness here in my home for my family, lies within me. Regardless of the trials, if I strive to be happy, if we strive to be happy, we will be. I truly think happiness is an innate force we are all given when born and something we strive for subconsciously. It's a conscious decision however to live your life, happy. We can get be led astray with life's difficulties, throw our hands up and cowardly have our pity party (trust me I have done that). We can lose focus, play the victim, and allow adversity to get the best of us and lose our destination. The day to day shuffle, the pressure of finding balance between family, work, obligation, life can become overbearing and unweildly. However, if we choose to continue to stay on the path of happiness, we will not get lost. 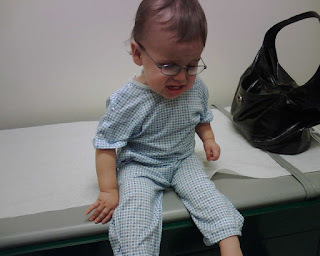 For a while, at the beginning of my learning time (that's what I like to call the phase right after getting Gavin's diagnosis), I did not want to be happy. Sure, I would say I wanted to be, but I did not want to be happy. 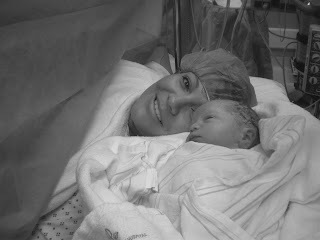 I did not want to be happy with the news I was given, our new life with our son and a disability I knew nothing about. Being happy meant I was accepting it. I did not want to accept it, you can read that about here. But now, after the acceptance, comes happiness. I am naturally a happy, see the glass half full type of person. I went off track a little with my pursuit of happiness, but it was always inside. It was my choice to choose it. For a while, I did not choose it. I hope you realize it is a choice to choose happiness. Whatever it be, defined only by you. Not by society, not by a measure of success, not by your peers, not by things, but by you. Our days are numbered, our life a blink of time. Find your joy, define it by your definition and choose happiness. Our life with Gavin, is a much happier place than 365 days ago. This time last year, I was confused with my inner turmoil that something is wrong with my child, and feeling like noone else shared my torture. Today, we are happy, I am happy and our choice to live our every single day full of happiness, is a choice we will continue to make. I hope you do the same, life is so much better making the choice and knowing it is an option. Disclaimer: Just speaking from my heart, and my experience. I know life throw some pretty scary, sad times at us. Not meant to put an easier-said-than-done overtone on this. Just looking back and sharing what I have learned through my sadness. I'm having difficulty uploading the video, so I will just add the URL here so you can link to YouTube to view it. There was a lot of buzz last week about Corey Haas. He was on Good Morning America, explaining the gene replacement therapy he received. He's 9 years old, has LCA, and was involved in a study that left him with sight. It's pretty inspiring, hopeful as well as emotional to watch this. We all know, my hope is for my son to one day have some vision. I cannot but help to put myself if his mother's shoes. I also cannot help to think that may one day be Gavin. As I watched this, with a very heavy heart, the only thing I can think of is "we are on the brink of something amazing happening, sooner rather than later." The articles I have read 8 months ago, compared to what I have recently been informed of, just in those short few months I have seen progress. Whether it be more awareness, or younger participants, etc. Maybe I am just more aware, but the momentum is continuing, and I will do my best to raise awareness in my little corner of the world. Let it be known. Gavin was created by God, just the way he is. I love him just the way he is, I accept him as he is, I treasure him. Just as he is... which is perfect. I have said it before, I will NOT let his vision impairment hinder him from being the best person he can be. I also will NOT let it define who he is. He is more than his disability, it is only a fraction of who he is. These are words I have said many times, but they are so true. His world, his life, is not any less meaningful than any of ours, just because we do not live in the darkness he does. One day, this gene replacement therapy may be the norm. I have to prepare myself with the reality that he may choose NOT to have it. I will respect that and we will continue on. I speak so highly of gene therapy, for one, I am in complete awe with what researchers, doctors, etc.. are capable of doing. And, two... to give someone sight, I am just speechless. I am speaking from a parents view point here, and not someone who lives with a visual impairment. I know there are two different views on this topic, and some of those views, honestly, are quite shocking. It just shows how much I am learning, and how you truly cannot judge one's position in life without living where they have. There are people who live with a visual impairment, who accept the impairment, and do not view it as a hinderance, or as something they would want to change. On the other side, you have those who would jump at the chance to see a little bit more. Of course, for my son, I am on the side who would go to great lengths to do whatever it takes to give my son more vision. I will also sit on the other side with him, if he one day chooses not to go forward with therapy, if he is so given the chance. I hope to one day have this be an option for him, but I have learned, what I want more than anything is to understand. I want to understand his perspective. I will always respect it, but would love to understand. I'm sure he will show me, he already has, and I am going into this with a complete open mind, letting Gavin and God guide me down this road. As a parent we want to fix, fix, fix our child if we can. Fix the broken bike, fix the scraped knee, fix the bump on the head, fix the blindness. Now as a parent with a child with a vision impairment, all I want is to understand, understand, understand. In my eyes, Gavin does not need to be fixed. He is just as he should be. Would I like him to see more? Definitely. If he chooses to make that decision not to, and old enough to make that decision, would I support him? Definitely. He is who he is, just as he is. Have you ever had a moment that has literally taken your breath away? Your breathing is actually haulted because you are trying to process a moment that you can't begin to conceive? Words you can't begin to believe? Have you ever had a moment when you felt so defeated, because you can't fix something, you can't make it better? Have you ever felt so much gratitude from others that your attitude towards mankind and the sincerity of good-hearted people, has changed? I have. It happened this year. Has your passion for a cause actually take over and drive you towards an unknown destination, because the journey and impact is worth it? We have experienced this... this year. Have you been so saddened that the depth of your heart truly aches. Your body actually hurts and the sound of your cry is different than any other type of cry that you have experienced? Have you ever felt grateful for something that has happened to your child, as sad as it is, because you know other parents are holding onto the last living moments with their child? I have questioned everything, and at the same time relinquished all my questions to someone who has the answers. My faith, my heart, my soul has been changed. I am a different person and changed for the better, all because of a little boy. 20 months ago, I was ecstatic to learn I was pregnant with you. 18 months ago, I was distraught, I sat in the ER thinking I lost you. 16 months ago, I was worried and hope to one day just hold you. 12 months ago, I was blessed to have you. 9 months ago, I mourned a part of you. Today, I am thankful for you. My promise remains as it was the day you were born. I will love you, guide you and help you become the best person you can be. I also promise to enjoy every single moment we have together, and make you smile and laugh. I will teach you not to allow someone else to narrow your soul by making you be unkind to the world, when the world is unkind to you. It's the least I can do, monkey. I can never repay you for what you have done for me. I am so proud to have you, and even luckier to be your mommy. This picture isn't out of the ordinary, however my 5 year old surprises me everyday with his uncanny, mature honesty. This picture was taken a few weeks ago, Landon was on his way out to soccer practice with daddy. Me and Gavin were staying home, Gavin was having a bad eye-pressing day, and was going to stay to put him in the bath to hopefully get him to stop. Landon: "Bye buddy, I'm going to go to soccer practice. I wish you were going, but that's ok, I'm going to show you how to play and be the bestest soccer player. Remember I love you (he gets louder) SOOOOOO much (then whispers again) I would give you one of my eyes so you can see me play soccer. Ok Buddy!" Oh hello tears! I'm so lucky to have them both, and they're so lucky to have each other. Landon's been asking again if Gavin's ever going to see. I told him one day he will, that's why we are dedicating ourself to the Foundation and everything we do. He said, "Why because if we do good, they'll give him new eyes?" "No honey (deep breath), but the scientists are working really hard to find treatment to fix his eyes." "That's ok mom, he sees me. He sees me with his hands, and people who can't hear very good hear with their eyes. Right mom?" "Yes, honey. We can all see." Landon glances to Gavin and grabs his hand as he's sleeping in his car seat. I picked my heart up off the floor, and we continued on with our drive. Two posts in one day... I should keep going and FINALLY get the golf pics up from the tourney -- I have been seriously slacking. Part of Gavin's therapy is to take items one at a time, out of a bucket. We need to work on him putting them back in, but as you can see.... once it's empty - it gets tossed. I love his smile when he knows his bucket is empty. The innocence is so cute. He's into tossing things left and right. I need to videotape me opening the car door, he tosses his toys, and when I open the door, they come charging at me and I look like a complete fool in front of everyone trying to catch these darn toys. I look like a drunk juggler. Of course this happens when I'm picking Landon up from Kindergarten, and there's a line of parents, already irritated there's nowhere to park, and then there's the drunk juggler taking her sweet ol' time. The trick is to make sure to grab them before they hit the curb and end up in the gutter. We come home with at least one gutter toy a day that gets tossed into the bathtub. Oh the joys! Apparently talking in high decibels when I get excited counting bucket items is something that is just too tempting too resist. We didn't win the chili cook-off, but we had a lot of fun! Our usual Gavin's Groupies of family and friends showed up with their orange shirts to support us. We were able to get some people interested in Vision Walk, pass out information and answer a lot of questions! That's all I got. It can't be more true. When my son and I are walking through the store, and you tell me how adorable he is in his glasses, my heart melts (he is pretty darn cute). When you ask about his condition, and I pour my heart out explaining quickly about his blindness - I appreciate your concern. But when you start waving your hands in front of his face, for the mere hope, that in that given second he will miraculously have vision and prove all my words wrong, I don't appreciate it. When I tell you, he sees well with his hands (as you can tell by the endless toys pouring out of my purse as a way to keep him occupied while I do my shopping), and you try to grab his hands (right after I tell you he is very sensitive and does not like hand grabbing), I do not appreciate it. When I tell you his glasses protect his eyes, and act as a deterrent to the eye pressing, please please please don't tell me he is probably just tired, and he is rubbing his eyes because possibly he skipped his nap. Really? I am the first to raise awareness and am open to questions, even on my darkest of days when I feel like crawling under my rock. When I see you staring at him, I tell Gavin to wave, as acknowledgement. I know it isn't everyday you run across a blind baby. I understand the curiosity, and welcome it. All of you who personally know me, know this. Just please don't blatantly disrespect my words, as I truly am trying to help you understand. It is unpleasant to be disrespected, and even though he is only 11 months -- he hears you and understands you. People often say time will change things. I, however, understand you need to change those things yourself. Today, for some reason, I was very nostalgic. I think because we have some kind of confirmation about Gavin, and we are out of this holding stage we have been stuck in for so long. I started sorting through some emotions of the past 11 months, and have realized how much progress I have done. I am going to share with you, my moment, where I think was my absolute saddest, lowest and challenging moment. It was a brief few minutes, but from that moment on, I continued to make baby steps and have come now to a place, where I believe Gavin will be ok and they are not just words that leave my lips to get me through the moment. "Please don't let my baby be blind"
I said this for about a whole 5 minutes continously and with each sentence, I got louder and louder. With each sentence, more sadness was coming over me. Before I realized, I was practically screaming at the top of my lungs and I was on my knees. I was uncontrollable. I was yelling. I was a mess and it was my lowest point. I picked myself up off the floor (actually I crawled to the bathroom), washed my face, and called his pediatrician and told him I HAD to see him. Little did I know then, that my baby would be blind. I realized as I was going through my screaming, in the back of my mind, I was hoping God would hear me. It was my way to shout out, that I am not ok with my son being blind. I was no ok with these cards he had dealt me. I was NOT ok with going through my stressful pregnancy, knowing I could lose him at any moment, coming home with, what seemed like a perfect little baby. And, now, you want me to be ok with my son being blind? I was not OK with it, and that was my way of shouting it to the world. I wanted everyone to hear it, and I felt at the moment, I couldn't stop until someone did. I am putting myself back in that moment, and I have tears streaming down my face. This is difficult to put myself back in that moment, and I look back realizing how broken I was. I needed to go through that transition point. That was the start of my acceptance, without realizing it. I was defying God and what he gave me. It was an absolute breakdown of my spirit, my soul, and my emotions. I carry that moment with me. I relive it from time to time, at moments when it just hits you. Out of the blue, I see something, something I know he can't see or touch, like the sky or the sun, and I relive a brief moment of my breakdown. I expose myself to that pain for just a short time, because it's something I don't think will ever leave. It is embedded as part of who I am, and it's a moment that my soul needed to experience before I could truly, really accept Gavin's condition. Not Gavin, but the blindness. From that point forward, I began to trade expectation for acceptance and as a family we have not looked back. We have had our fair share of bumps in the road, but nothing to make us stop and turn around. I am ok with our obstacles. I am ok with these cards. I am ok with my son being blind. I traded expectation for acceptance and, to not sound corny, it truly has made a world of difference. God did hear me. But, the difference is, I began to hear him. Gavin's ERG was a success. He did great. We started the day with a few bumps, Gavin had a little cold and we were unsure if we were going to be able to proceed with the procedure. He passed his physical, and the nurse cleared him, but the anesthesiologist has the final say. Talk about shaken nerves. The nurse came by and said she wanted to prepare us, but typically a cold is a deal breaker as far as anesthesia. Lovely! We were paid a visit by the anesthesiologist and she ordered a nebulizer, breathing treatment for Gavin and then she was going to see how he was doing. Mind you, he was already sedated with a liquid sedation, and his eyes were dilated, and we were STILL unsure if we would proceed. UGH! After about 4 hours from the time we stepped foot in the hospital, Gavin got the green light, we kissed him and off he went. My heart feels for all the parents who have to send their child into surgery. His procedure wasn't even evasive, it was very minor, but still major since they had to put him under -- but, that is the worst feeling. A last kiss as he lays in the bed, and gets wheeled off by the team of nurses. My heart sank. The ERG confirmed everything we had expected. Dr. Lee called us in for a consultation as soon as everything was complete and brought in all the equipment so we could actually see the pictures of his eyes. Fascinating! Both of his eyes are pretty much mirrored copies of one another (a clear sign of a hereditary condition). Dr. Lee has the only machine in the country that will show detailed pictures of over 100 layers of his eye. We were able to view everything, as well as the atrophied areas that are causing his condition. There is a representation of cone/rod abnormalities in the RPE layer of his eye. All of what he saw pointed in the direction of Leber's Congenital Amaurosis. Only blood work detecting the gene will 100% confirm, but basically he did confirm that he has LCA. The next topic was onto what Gavin can see. The ERG readout on someone who is sighted will have big spikes in activity like an EKG basically. The spikes are the brains reaction to the light. Gavin's ERG was pretty much flat. We were prepared to hear this. I expected it. 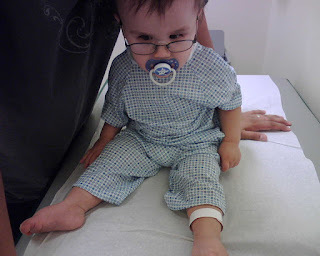 It is still a daggar to the heart when his doctor is confirming everything. I could tell it was difficult for him to give us this information. I semi-interrupted and told Dr. Lee, we were expecting this news. He put his head down, and nodded and looked at the readout and showed us. There was hardly any activity. I looked at it and looked away and cried. Not that I was surprised, but to get it confirmed, is another layer of sadness in a way? It's hard for me to put it in words. It is fair to say, Gavin is blind. He can detect light, but no visual acuity. He ended our consultation with a glimmer of some big hope. As I have stated before, science is on the move with finding treatment for blindness. There is not hope that one day there will be research. Research is happening right now, all over the world, and he confirmed with what I have researched, that LCA is a huge area of study. Gavin may be a candidate for a study in the upcoming years, which is wonderful to know. There is hope for Gavin, and many others who are in the same boat. It's an exciting time in the area of research, and we can't wait to see where it will take us. Thank you for your kind words and messages of hope, from people I don't even know. It helps me to move forward and march on to raise awareness! "Not liking these funky hospital jammies, mom." 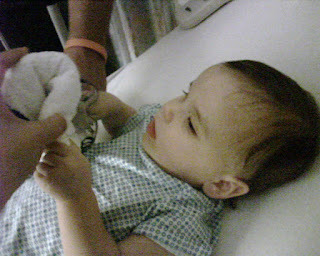 Fighting the breathing treatment, even though sedated. I have a little spitfire on my hands! We have been approved! Dr. Lee at CHLA did his magic, and insurance has approved and CHLA agreed. Mumbo jumbo... blah blah blah. I don't know all exact details, but I do know we will be getting the ERG (Electroretinogram) at Children's Hospital LA very very soon. This will confirm our suspicion of the disease, and we can move forward with further blood work on Gavin, as well as with Landon, Troy and myself. The puzzle pieces will finally be put together. We have the end result of the puzzle, which is Gavin and his vision impairment - what we do not have for the past, almost 6 months are the itty bitty pieces. I am beside myself to finally be able to recognize the disease, identify more with causes and begin my work on the gene research. I am totally aware the gene may go unidentified, I get that. We spoke to some people at the conference in our LCA group break out session. Some have experienced kidney failure/problems as well as seizures and hearing loss. Getting an identification of exactly what he has is HUGE. It will either put my mind to rest, or get on the ball and have continued tests done on Gavin for the above reasons. Sorry family to hear this on my 'blog'. I finally got a moment to jump on here, and had to share! I could not keep it in any longer. We got word of this late this afternoon, Troy and I are elated. This has been a very long 6 months of waiting. Dr. Lee is my hero! He went above and beyond, and did not give up. THANK YOU! And so our next chapter begins, and I'm so ready to turn the page. Gavin loves music. He loved hearing his cousins "Jonnie and Brookie" perform. They ROCKED! Can't get any better than three grandma's at the fair spoiling your kids rotten! Whoo hoo! I hear music. The fair turkey legs don't taste as good as mine. Enough Corn on the cob, Cream Cheese on a stick, turkey legs and Fried Avocado and twinkies for one night.